Developers say they are "unlikely" to accept an offer designed to safeguard the future of greyhound racing at Walthamstow Stadium in east London. A consortium has offered £1m more than the current owners paid for the site. But London and Quadrant Housing Trust, who bought the land in May, said it did not look like a "genuinely viable option for a number of reasons". Falling profits and attendances forced the original owners of the dog track to sell-up after 75 years. L&Q Housing Trust, part of the development consortium Walthamstow Stadium Developments Limited, will take ownership of the land on 1 September. A spokeswoman said it had received "a short proposal", from a consortium led by Australian millionaire Rick Holloway, which included "a one line offer... to buy or lease the site but neither look like genuinely viable". But she said the offer was being considered and Mr Holloway would receive a more detailed response soon. The spokeswoman said L&Q hoped to use the land to ease homelessness, overcrowding and poor quality housing within the borough. She said that in order to meet the "huge demand" for affordable housing in the area any proposal was likely to include about 50% of this kind of housing. A planning application is due to be submitted later this year. As part of the plans the stadium's famous facade with pink and green neon-lit sign will be retained in recognition of its history, she added. 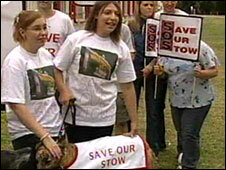 Campaigners staged a protest against the closure outside the stadium on Thursday night. Barry Clegg from Walthamstow Owners and Welfare Association said: "There is so much that could be done to even improve this great stadium further. "I think the place will be jam packed in the future, not just on a Saturday but probably mid-week as well. It is a great stadium, it's a great sport." Mr Holloway said: "Communities need attractions, they don't just need housing." Racing will continue at the iconic London landmark until 16 August.